The Annotated Hans Christian Andersen, annotated by Maria Tatar – This book, with notes by the same person who did The Annotated Brothers Grimm, was a gift from Tavie. I’d read some of Andersen’s stories before, but many of them I only knew through second-hand descriptions, rather than the man’s own words. For some reason, we in English-speaking countries insist on calling the writer of fairy tales by his full name, sort of like James Earl Jones. It’s apparently more common in his native Denmark to just call him “H.C. Andersen.” Perhaps English-speakers like to highlight the “Christian” part, which is pretty significant to his themes. The Grimms also added Christian ideas to what were originally pagan tales, but they weren’t quite as blatant as Andersen. I mean, the only happy ending the Little Match Girl gets is that her afterlife in Heaven will apparently make up for her crappy time here on Earth, and the Little Mermaid’s goal is to obtain an immortal soul. (Not surprisingly, the original Little Mermaid story is quite different from what Disney did with it, but I’m sure I’ll eventually get to that in the Revisiting Disney series.) Even “The Snow Queen,” with its personified nature spirits and helpful witch-women, has Kai longing for the Christian version of eternity while living in the Snow Queen’s icy domain. Andersen’s personal life was really quite interesting, and often very strongly reflected in his stories. In autobiographies of himself (Andersen was nothing if not shamelessly self-promoting), he claimed to have lived a fairy tale life. What I find particularly weird about this is that, as an American, I’m so used to people wanting to come across as self-made men. Even people who had quite privileged childhoods like to claim they pulled themselves up by the bootstraps, because they know that sells. Andersen, on the other hand, presented his childhood as idyllic, even though he actually grew up in poverty and had a rather troubled home life. In other words, he really WAS a self-made man, yet he made efforts to conceal it. I guess they aren’t so big on the American Dream in his part of the world, which is why it isn’t called the Danish Dream. Andersen was homely in appearance and never married, instead constantly falling in love with people, both male and female, whom he knew to be unattainable. His most famous female crush was a popular singer. No obvious gay stereotypes THERE, huh? :P I’ve also read that he kept a masturbation journal and visited brothels (although he apparently always left in shame before actually doing anything there). 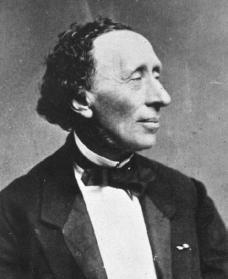 In addition to the religious themes, there are other concepts that arise quite frequently in Andersen’s writings. One is the constant emphasis on shoes, which makes some sense as his father was a shoemaker. His tales treat shoes as a luxury that his poor characters often lack. They can also be a symbol of vanity, as in “The Red Shoes,” in which a girl so obsessed with her fancy red shoes that she inappropriately wears them to church is forced to keep dancing until someone cuts off her feet. This entry was posted in Book Reviews, Christianity, Fairy Tales, Historical Personages, History, Jack Snow, L. Frank Baum, Oz, Oz Authors, Religion and tagged brothers grimm, hans christian andersen, jenny lind, maria tatar, story-blossom garden, the annotated hans christian andersen, the girl who trod on the loaf, the little match girl, the little mermaid, the magical mimics in oz, the red shoes, the snow queen, the wonderful wizard of oz. Bookmark the permalink.